The MHA wanted IPS officer Basant Rath disciplined for writing columns “dangerously critical of government policy” but the J&K government chose to promote him instead. 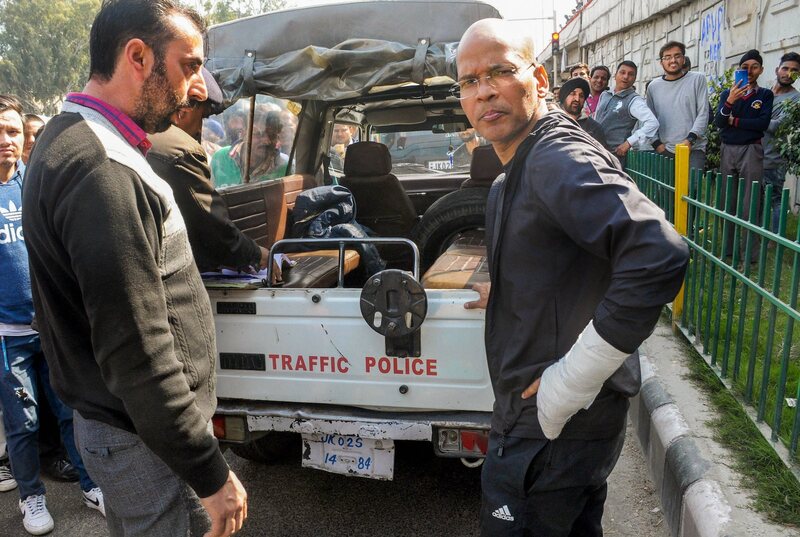 Inspector General of Police (Traffic) Basant Rath, right, during a traffic inspection in Jammu on Tuesday. 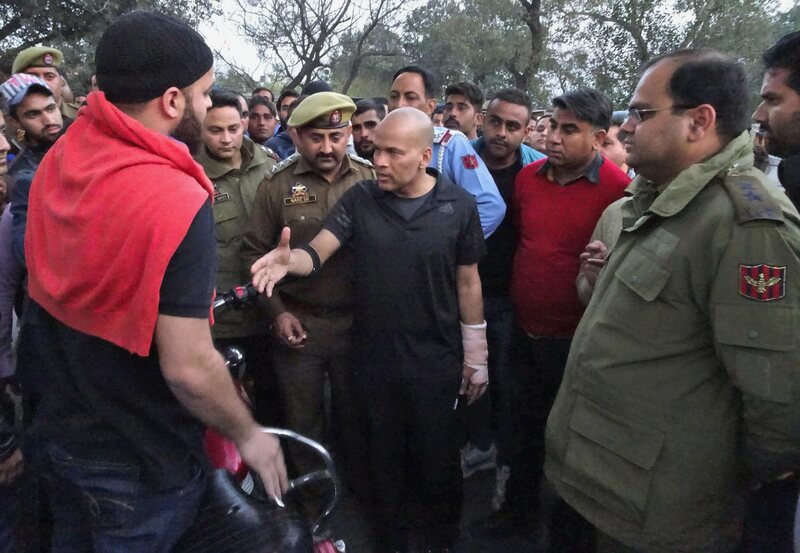 Less than a fortnight into his new assignment, Rath has been trying to manage traffic in Jammu that is drawing applause and brickbats for his flamboyant work style, with some comparing him to the wildly popular protagonists in Bollywood movies like Singham and Dabangg. Credit: PTI . New Delhi: At a time when non-state actors are attacking the freedom of expression of students, writers, artists and film-makers, a new front in the war on free speech has opened with the Union home ministry seeking disciplinary action against a senior police officer for his writings in the national media, especially The Wire and the Indian Express. The officer under the Modi government’s scanner is Basant Kumar Rath of the Jammu and Kashmir cadre of the Indian Police Service. He was recently promoted to the rank of Inspector General by the Jammu and Kashmir government and put in charge of traffic. An upright officer, he is being called “Singham” – after the iconic no-nonsense Mollywood cop – for his tough approach to traffic violators. The MHA, as per a report in The Quint, has accused Rath, a 2000 batch officer, of violating the All India Service Rules and has urged the Mehbooba Mufti government to take “action” against him. The home ministry had initially ordered a “discreet inquiry” by the Intelligence Bureau against Rath in 2016-17 as it had found some of his articles appearing in The Wire and the Indian Express to be supposedly in violation of the service rules. Rath has written a total of 28 articles for The Wire since August 2016. His last two pieces were on the need for effective policing against Valentine’s Day vandals and on the need for police officers to have allegiance to the constitution rather than to a temple. All his articles deal with broad policy issues as they relate to security and policing and carry a standard disclaimer at the end: “Views expressed are personal”. He has never written on issues he directly deals with, or indeed on the situation in Jammu and Kashmir, except one article on the death of six young policemen in J&K, where he urged that their sacrifice in the battle against terrorism evoke “respect and not chest-thumping by social media warriors”. It’s the Politically-Connected Mining Mafia, Not JNU Students, We Should Question on Naxal Violence. In this Rath had raised the issue of how illegal mining syndicates and the Maoists share a symbiotic relationship – they both want the isolated, backward districts of Chhattisgarh to stay that way. In India, the Underworld-Politician-Police Nexus Is Clearly Visible – and Visibly Ignored. The Many Criminal Injustices of India’s Police and Investigating Agencies. In this article Rath had questioned why investigators are never held accountable for their criminal misdeeds and go on plying their trade with no fear of punishment. 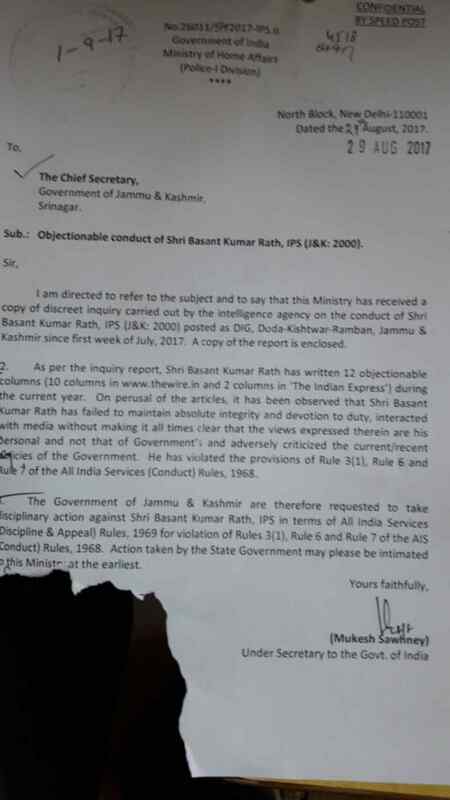 The Intelligence Bureau is also learnt to have termed Rath’s articles as “seditious” and said they can have “serious consequences” over the morale and discipline of the police and security forces in Jammu and Kashmir. Following this ‘discreet inquiry’ from the IB and its detailed report about the officer’s alleged “objectionable conduct”, The Quint reported that the MHA in August 2017 asked the Jammu and Kashmir government to take “disciplinary action” against Rath. The decision to leak the MHA’s August 2017 letter comes in the wake of the J&K government’s refusal to take disciplinary action against Rath – an officer who is highly regarded in the state – but to actually promote him. While the Centre has invoked the All India Service Rules to justify action against Rath, retired police officers, advocates and serving administrative officers The Wire spoke to believe that Rath is on a firm footing as his writings have all been about how the policing and security mechanisms need to be improved, are not critical of the state or the Central government, and steer clear of political partisanship. Rai, who had exposed the killings of Muslims in the 1987 Hashimpura riots and had in the wake of the 2002 Gujarat pogrom issued an open letter to IPS officers whom he considered responsible for the failure of law and order, said there are several rulings of the Supreme Court which protect an officer’s right to have his say on such social issues in the public interest. Noting that while in general the laws pertaining to freedom of expression should apply in such matters, as long as officers stay within the bounds of conduct prescribed by service rules there ought to be no issue. A senior serving government officer, who has had frequent run-ins with both the Centre and state governments, however noted that “if Rath has been promoted then there is not much that the Centre can do”. The officer said the state government has the power to promote an IPS officer and the J&K government has promoted Rath despite the Centre branding him negatively. Ideally, he said, the state government will have to seek Rath’s comments before taking any action against him. Also, he said, it was the state government’s prerogative on whether they see merit in the Centre’s argument or if they believe that Rath has done no wrong. A closer look at the service rules, which the MHA note itself cites, makes it clear that as long as the official says the views are personal, there is no bar on his or her writing. Moreover, apart from the disclosure in all his pieces, Rath had neither attacked the government, batted for any party or written against “India’s relations with friendly countries”. In fact, a look at his articles reveals Rath’s penchant for writing on issues that reflect on the challenges faced by the policing system in the country as how and why it should be improved upon. In this article, he pointed out how a gender diverse police force would be more equitable and more approachable. The piece referred to how the Mumbai police had in January 2018 switched to an eight-hour duty schedule for the constabulary and assistant sub-inspector levels and how the rest of the country needs to follow suit. This article spoke of how year after year, people are dying in incidents that are termed ‘accidents’ but are actually man-made disasters. The article was why the police constable who went into the fire that broke out in Kamala Mills, ill-equipped and unprotected, and saved eight lives, needs to be thanked. It was about how Indian prisons are overcrowded and understaffed and noted that unless these issues are dealt with, prisons will remain hellish for the socio-economically disadvantaged. Each of these pieces were well-researched and tried to deliberate on a topic of public interest. 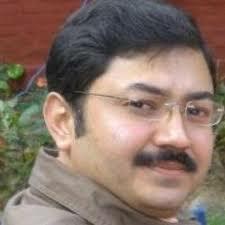 But what apparently appears to have riled the Centre even more are the pieces he wrote citing his alma mater, Jawaharlal Nehru University, and the way the academic atmosphere has been vitiated there over the past couple of years. Apart from the one cited in the IB report, his articles in The Wire include another on JNU – ‘A University Is Not a War Museum’ – in which he questioned the proposal to place an Army tank in the university. Rath had in 2016 also written about the leadership crisis in the police in Biryani Policing and the Leadership Crisis in the Indian Police Service where he argued that IPS officers such as himself are under an obligation to act like leaders, and not as mere passengers. But nowhere do these writings defy Rules 3(1), Rule 6 and Rule 7 of the AIS (Conduct) Rules, 1968 as alleged by the MHA. “Previous sanction of the Government shall not be required when the member of the service, in the bonafide discharge of his duties or otherwise, publishes a book or contributes to or participates in a public media.